I have been really into making my own holiday wreaths especially since buying them can get really expensive. Plus, I love anything I can DIY. So of course I was going to make one for Easter. I decided to skip St. Patrick’s Day but I do plan to make a overall Spring one to use as well. 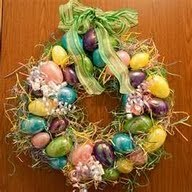 I was inspired by these Easter wreaths found on pinterest. There are all kinds of ways you can customize yours to fit your personality or likes but this is how I made mine. I bought the branch wreaths at Dollar Tree. I stacked these together to have a bigger wreath and more room to work with. I just used some wire to secure them together but you could use anything (string, glue, etc). I also got the ribbon at Dollar tree as well. The eggs I picked up in Target’s $1 spot and the grass at walmart. All of this costed me right around $7 total. I picked the bunny decor up at Hobby Lobby. It was 40% off and costed me about $5. So overall I spent a total of $12ish dollars on this wreath. It could cost you less if you have supplies on hand or more depending on the supplies you choose to use. 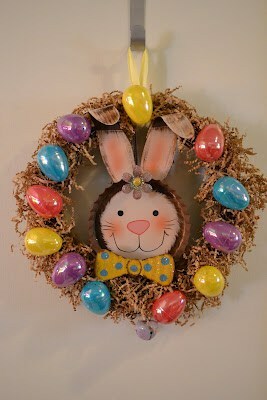 I simply attached my wreaths together with wire and then hot glued on the Easter grass. After all of the grass was cooled I centered my bunny and attached him with my ribbon. 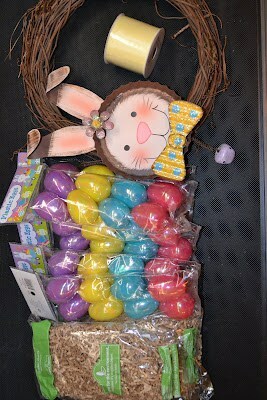 I then hot glued on the Easter eggs. Let everything cool and set up well before trying to hang otherwise you might have eggs falling off. Sorry I didn’t take pictures while working on it. I really need to make that a habit. I just get focused in crafting and totally forget. Oops! Do you like to make your own holiday decorations? 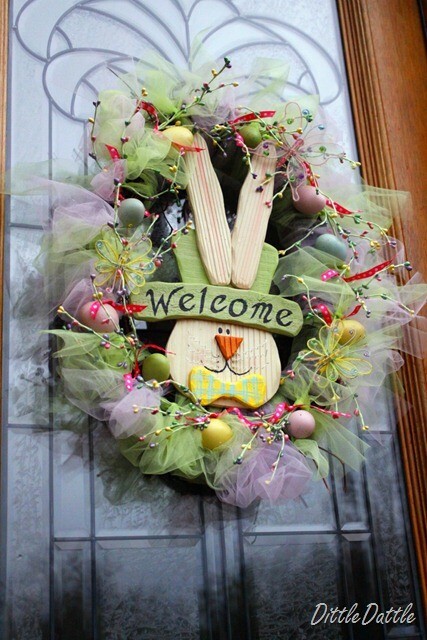 Have you made a wreath for Easter? How adorable-following you from Southern Hospitality-stop on by for a visit! Very cute! I love how you added the eggs!